Not just lip service . . . The Ultimate Romantic message: immortalise your kiss on a tile with a personal message or poem and send it to your loved one. Ontiles.com of Sloane Square have new technology that can put your lips onto a ceramic tile (6"x 6") or cork-backed coaster. (3.5"x 3.5"), which will last forever. 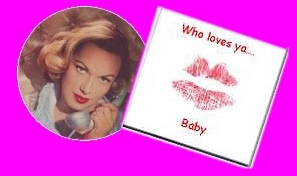 Cost is only £16 plus P & P.
Alternatively, buy one of a range of our own Kiss Tiles or coasters, with various captions such as Lip Service or Guess who Fancies You.If you don't fancy your own kiss you can select one of our own set of kisses. See the order forms. Click here for full instructions and order form!